In 2-quart saucepan, heat milk, hot water and margarine to a rapid boil over medium-high heat (watch carefully to avoid boilover). Remove from heat. Stir in 1 pouch Potatoes with Seasoning just until well blended. Let stand 4 to 5 minutes or until liquid is absorbed. Meanwhile, cut 4 pieces plastic wrap, about 9x12 inches each. Line insides of 4 (6-oz) custard cups with plastic wrap; spray with cooking spray. Divide potatoes evenly among custard cups. Press firmly; turn upside down onto individual serving plates. Remove plastic wrap from each potato mound; choose from suggested ingredients above to make faces. Serve immediately. Tip : If you don't have 6-oz custard cups, try shaping the mashed potato heads using a small bowl, or wet your hands and form them by hand. 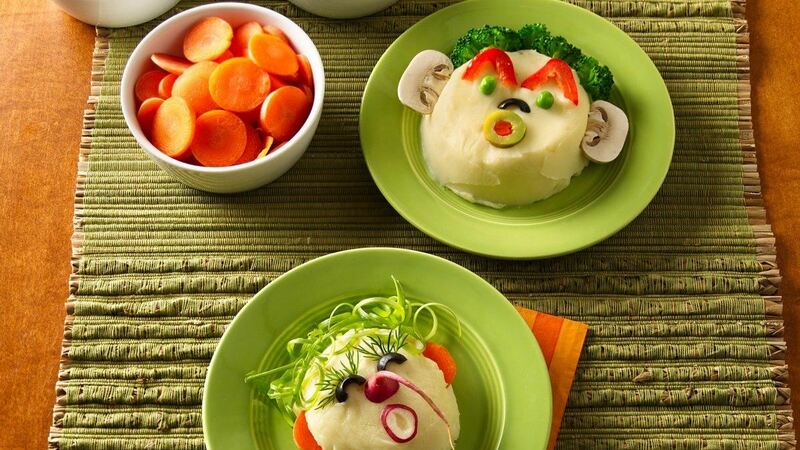 Tip : Set out bowls of the ingredients for faces, and let your kids use whatever they like to create their own monsters.